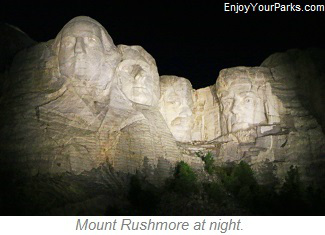 Mount Rushmore National Memorial is one of the greatest iconic symbols of the United States. Located in the Black Hills of western South Dakota, Mount Rushmore National Memorial consists of the heads of presidents Abraham Lincoln, George Washington, Thomas Jefferson and Theodore Roosevelt, all carved into the massive granite face of Mount Rushmore in the Black Hills of South Dakota. 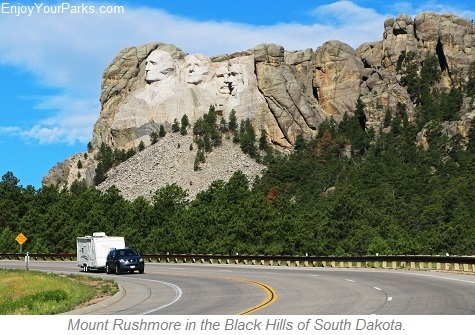 Sculpted by Danish-American Gutzon Borglum and his son Lincoln, this national treasure covers 1,280 acres and is 5,725 feet above sea level. 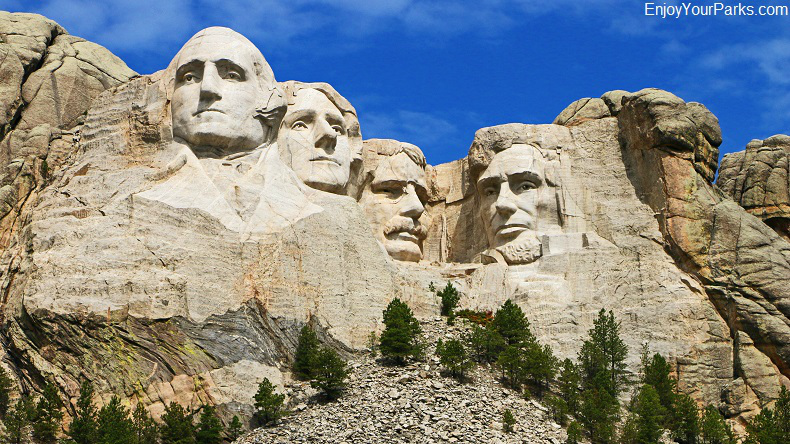 The granite heads of these great presidents are over 60 feet in height, and can be seen from many miles around. 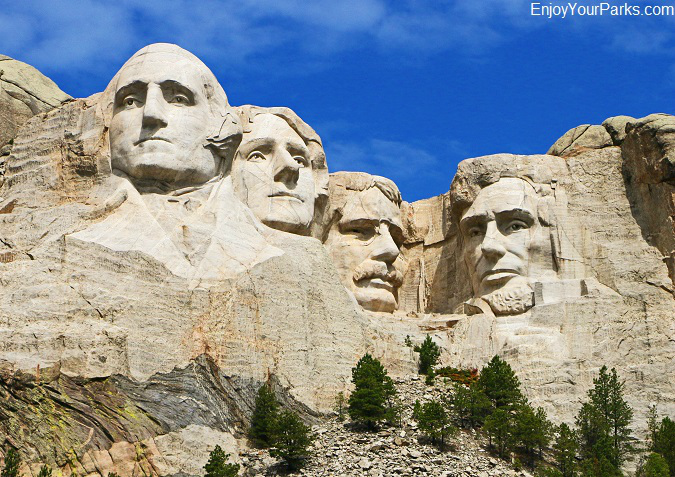 Completed between the years 1934 and 1939, Mount Rushmore National Memorial is enjoyed by over 2 million people each year from all over the world, and is an absolutely "must see" during your South Dakota vacation. 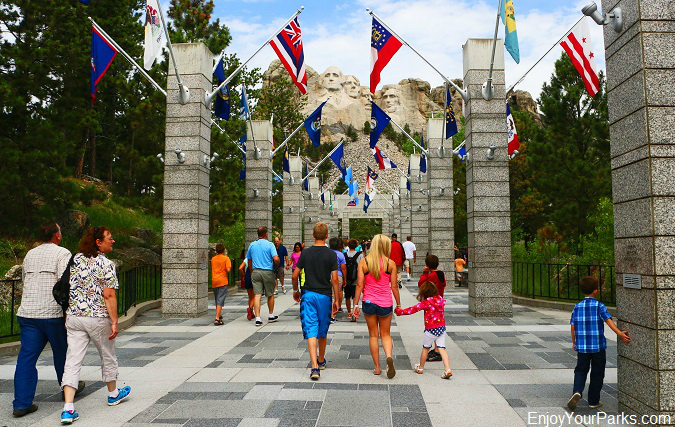 Visitors enjoying Mount Rushmore National Memorial in the Black Hills of South Dakota. Borglum chose Washington, Jefferson, Lincoln and Theodore Roosevelt to represent the first 130 years of American History because of their significant role in preserving the Republic and expanding its territory. After securing Federal funding, work began in 1927, and the actual carving of the faces began in 1934 and was completed in 1939. 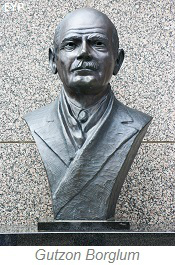 After Gutzon Borglum's death in March of 1941, his son Lincoln took over the project. head was initially on the left side of Washington, but due to the granite's poor quality in that particular spot they aborted that project by dynamiting the work, and instead carved Jefferson to the right of Washington. Over 400 workers worked along side Gutzon Borglum to help him sculpt the mammoth 60 foot high carvings. They used dynamite followed by a process called "honeycombing", which was a process of drilling holes very close in proximity thus allowing small pieces of granite to be removed by hand. Over 400,000 tons of rock were blasted off the face of Mount Rushmore. And even though the work was very dangerous due to the nature of using dynamite to blast rock, as well as the incredible heights these workers were suspended at as they worked on the colossal undertaking, surprisingly there were no fatal accidents during the entire project. 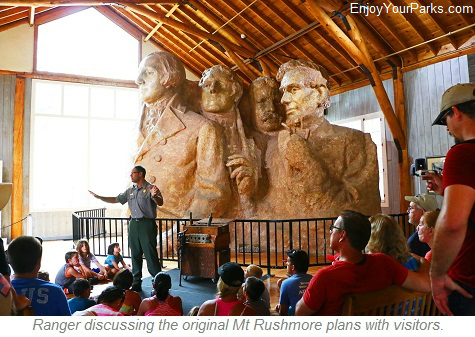 Visitors learning about the history of Mount Rushmore at the Mount Rushmore Visitor Center. Visitors heading for a spectacular view of Mount Rushmore! 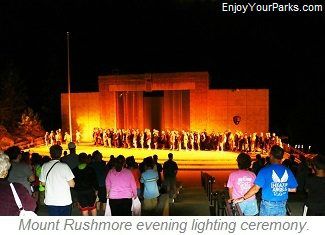 Over 2 million people from across the globe visit Mount Rushmore National Memorial annually. 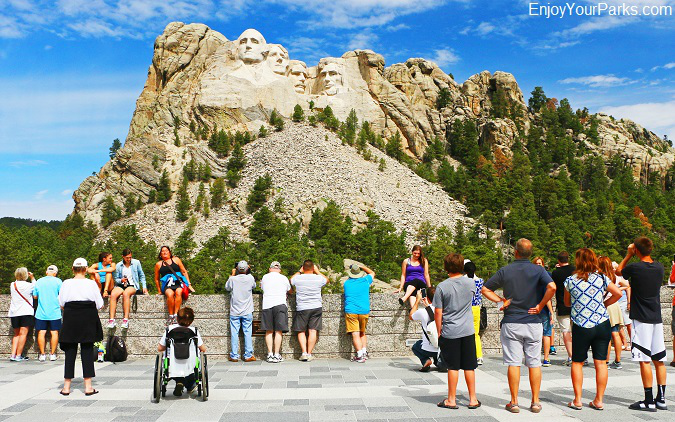 In addition to the memorial of the Presidents' heads carved in granite high on the south face of Mount Rushmore, there are outstanding visitor facilities including a wonderful Visitor Center as well as the Lincoln Borglum Museum and Presidential Trail. The grounds containing the extensive visitor facilities below the towering granite faces are gorgeous, fun and fascinating... and create an extremely satisfying experience. Also, make sure to attend the nightly "lighting ceremony", where every night after the sun goes down there is a lighting ceremony where huge spotlights light up the granite sculptures as military personel assist and patriotic music is played. This ceremony is very dramatic, and makes you extremely proud to be an American... and we highly recommend that you plan to see this emotional event. Mount Rushmore National Monument in the Black Hills of South Dakota. 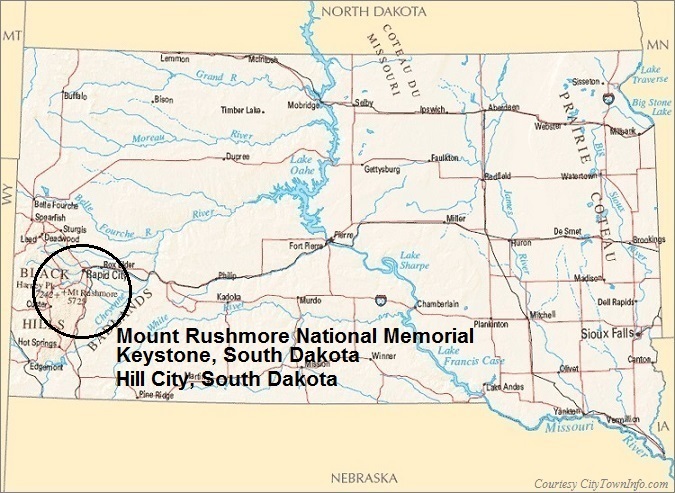 Keystone South Dakota, known as the "Home of Mount Rushmore", is located where Highway 16A begins its gradual ascent upward to Mount Rushmore National Memorial. 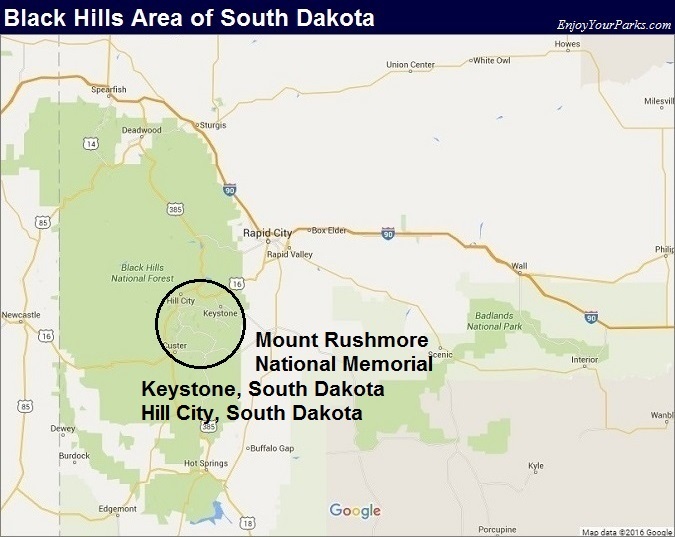 Even though it has a population of only about 350 people, because Keystone South Dakota is located in the "middle of all the action" in the Black Hills, it has become an extremely popular tourist town with many tourist attractions available to its visitors. 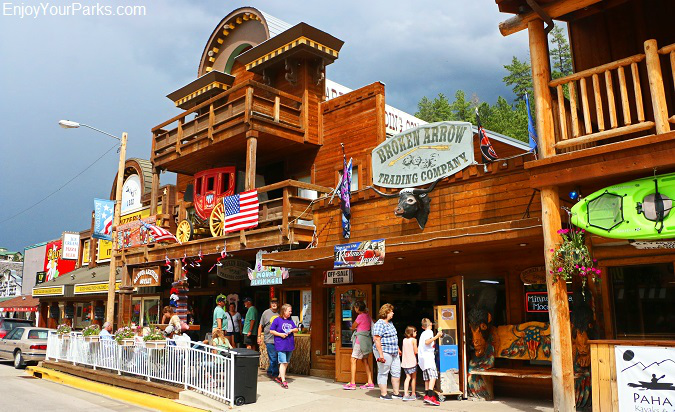 Founded in 1883 as a mining town, Keystone still maintains its "Old West" flavor and is truly a "must see" destination while on your South Dakota vacation. Black Hills Central Railroad, which was originally built in 1900 for hauling Black Hills Gold, is now a passenger train actually pulls by authentically preserved steam locomotives. 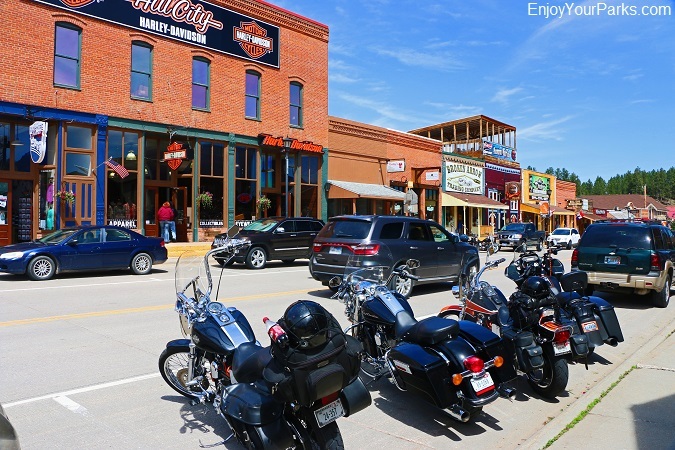 Passengers enjoy a 20 mile journey between Keystone and Hill City through the heart of the Black Hills. There are several trips provided daily, where each trip last about 2 hours and 15 minutes. The Black Hills Central Railroad is a classic South Dakota vacation activity, and you and your family will without a doubt enjoy the journey on this Old West train. The National Presidential Wax Museum is yet another major Keystone South Dakota attraction that deserves exploring. 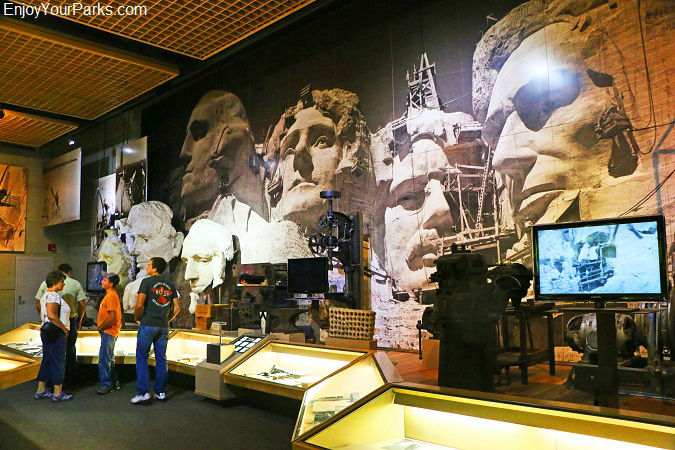 This amazing museum features wax scupltures of all of the United States Presidents, as well as a number of prominent Sioux Chiefs, notable inventors and influentual international leaders. These remarkably well-done wax figures were scuplted by the world-renowned sculptor by the name of Katherine Stubergh. Gold Mill that was constructed in 1895 on the property of the Big Thunder Gold Mine, and has become one of the top destinations for tourists visiting Keystone South Dakota. 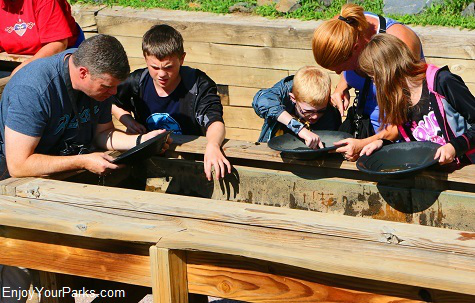 There are tours that take visitors into the mine, as well as a place for visitors to pan for their own gold and a wonderful museum that has the largest collection of equipment from Gold Mines in the Black Hills. Thousands of artifacts are on display at the Big Thunder Gold Mine Museum from three historic mines in the Black Hills that were reclaimed before the mines were torn down. During your time at Keystone, South Dakota, we highly recommend visiting this very entertaining, fun and informative attraction... It's great for the entire family. Historic Hill City: "Heart of the Hills"
Downtown Hill City, South Dakota. 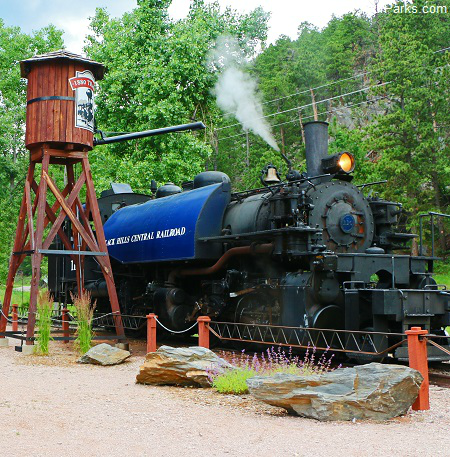 The popular Black Hills Central Railroad, also known as the "1880 Train", is a tourist passenger trail that runs between Keystone South Dakota and Hill City. 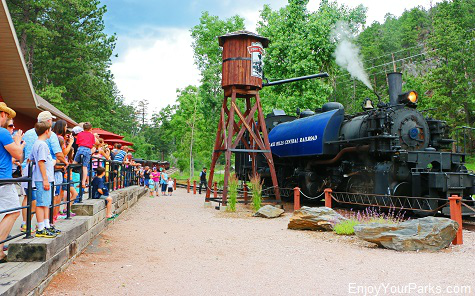 This historic train uses authentic Old West steam engines that have been restored, and provides a wonderful Old West Train experience for Black Hills vacationers of all ages. Also located in Hill City is the Black Hills Museum of Natural History, which is a top notch museum containing outstanding displays of dinosaurs, mammals, birds, reptiles, fossil fishes, gemstones, meteorites and minerals. The most popular display at the Black Hills Central Railroad is the Tyrannosaurus Rex dinosaur known as "Stan". Stan is one of the most complete fossil skeletons in the world, where 65% of his skeleton has been found. Hill City has become the center for visual arts in the Black Hills area, and is home to seven art galleries and studios that feature several top regional artists. Hill City hosts several popular arts events as well throughout the year, and are always a special treat for Black Hills visitors.